Ok, so here's the next unit. The retinue of William Neville, Lord Fauconberg. Fauconberg, younger brother of the earl of Salisbury, was one of the most experienced military commanders of the first half of the fifteenth century. He had fought both in Normandy (where he had been captured in 1449 while on embassy, being unfortunate enough to be in the castle of Pont de l'Arche when it fell to the French) and on the northern borders. From 1459 he acted as lieutenant to his nephew, the earl of Warwick, as captain of Calais, and at Towton two years later he commanded one of the Yorkist battles. Finally got a chance to photograph my first Lancastrian unit - the retinue of Henry Percy, 3rd earl of Northumberland (killed at Towton). 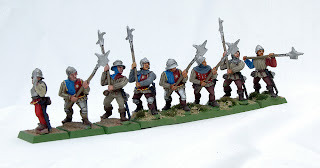 These are obviously Perry plastics with the earl himself a metal Perry. There's also a random Steel Fist man-at-arms at the end. It's a gorgeous figure and I painted him up on his own base. The other guy with the heraldic surcoat is William Bertram of Bothal, Northumberland, one of the earl's most trusted retainers who died of wounds suffered at Towton. Bertram is an interesting one: he was the son and heir of Sir John Bertram and cousin to Sir Robert Ogle, who would later be raised to the peerage for his service to the House of York. William entered the service of the 2nd of Northumberland in 1440 but remained on friendly terms with the Ogles right up until 1459/60. 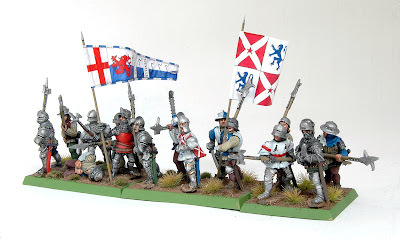 On 3 April 1449 the King and council wrote to Bertram, Sir Ralph Percy and his cousins, Sir Robert and John Ogle, thanking them for their recent report on the defence of the borders and assuring them that ‘the purveance and saufgarde of the saide countrees and marches . . . hath ben righte sadly communed of by the lordes of this oure parlement’. On 30 December 1460 William was present alongside the 3rd earl of Northumberland at the battle of Wakefield, and his faithful service to the Percys was rewarded when he was among the eight men upon whom the earl of Northumberland bestowed the honour of knighthood after the battle. It seems likely that Bertram was also present with Northumberland at the second battle of St. Albans in February 1461. On 29 March that year the Lancastrian army met Edward IV at the battle of Towton, where both Northumberland and Bertram, his faithful retainer to the end, were killed. My next unit is Yorkist - another northerner, William Neville, Lord Fauconberg. Had a bit of a frustrating week. I ordered the Claymore Casting Otterburn figures, which are excellent and will provide a nice little painting project, but also some Flags of War flags. Geez . . . are these big! 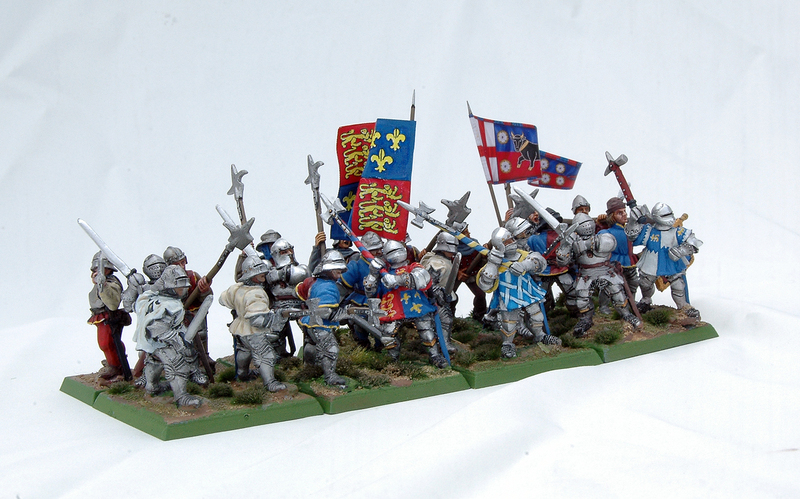 Too big in fact for my Perry Miniatures' earl of Northumberland and his retinue. The unit is ready, just waiting for the last banner but that'll hopefully be done by Wednesday, so I'll post that later this week. Also just started on my William Neville, Lord Fauconberg, retinue. I switched to a black undercoat for these and the last of my Percy retinue and I'm very happy with the result (and the extra speed of painting). Fauconberg is one of my favourite characters from Lancastrian England. It's perhaps a measure of how bad things were by 1459 that a man who had risked life and limb for, in fact dedicated his life to the Lancastrian Dual Monarchy could find himself arrayed against a Lancastrian king. 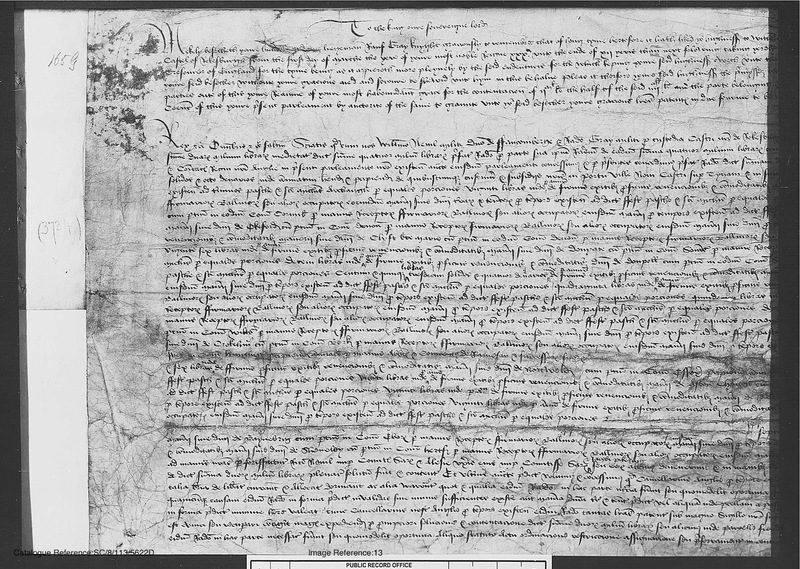 One curious example of just how complicated allegiances were in 1459 comes from this petition presented to the Coventry Parliament (the Parliament of Devils). In it Sir Ralph Gray (the tricky Northumbrian knight who changed sides several times during the Wars of the Roses and was finally executed in 1464 after being captured following the siege of Dunstanburgh castle) asks for the forfeited lands of the earl of Salisbury to be used to discharge his debts incurred in defending Roxburgh castle. Gray had been appointed joint keeper of Roxburgh with Fauconberg in March 1452, but Fauconberg had spent most of the 1440s in France being captured in 1449 and the payment of his ransom took most of his energies and money during the early 1450s. In September 1458 Gray secured a royal commission to inquire into the state of Roxburgh. The commissioners’ findings reveal the considerable personal expenses he had incurred. According to the jurors, on 10 March 1457 the tower known as ‘le Kynges Toure’ and the adjacent walls collapsed and, as a result, for the following 20 weeks Sir Ralph was forced to keep 100 extra soldiers there while the walls were repaired. This cost him £166 13s. 4d. in extra wages out of his own pocket, while he spent a further £269 13s. on the building work itself. It was these extraordinary expenses on top of the usual problem of receiving payment for the safeguard of Roxburgh that lay behind the petition Gray presented to the Coventry Parliament of 1459. We don't who was elected as the MPs for Northumberland, but given Gray’s pressing financial affairs it seems likely that he travelled to Coventry as one of the knights of the shire. The petition outlined the list of revenue sources that Gray wished to be assigned for the payment of his debts. 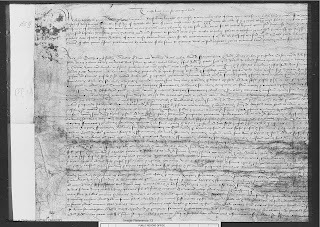 Its preamble explained the terms of the indentures he and Lord Fauconberg had sealed with the King in 1452 and claimed sums in excess of £4,000. Fauconberg, Gray continued, was no longer resident in Northumberland but was ‘in othre parties oute of this youre Reaume’ (in fact he was in exile in Calais where he served as lieutenant to his nephew, the town’s captain, Richard Neville, earl of Warwick). The draft letters patent then detailed the arrangements for the payment of £2,000, the amount owed to Gray. While £133 6s. 8d. of the sum due was to be collected each year from the customs in Newcastle, the rest was assigned on various manors and other revenues seized from the attainted earl of Salisbury. Gray’s petition was agreed to by the Commons and on 20 November 1459, the opening day of Parliament, the letters patent were issued. It is difficult to interpret the background to this grant and its timeframe. On the one hand, Gray’s success in ensuring the Neville lands continued to sustain the defence of Roxburgh and preventing the castle and the revenues assigned for its maintenance from falling into the hands of the Percy family might represent his loyalty to the Nevilles, alongside whom the Grays had served for more than 20 years. Alternatively, he may favoured by the Lancastrian regime to act as a counterweight to the Neville retainer, Sir Robert Ogle, who had replaced Fauconberg as joint keeper some nine months earlier. 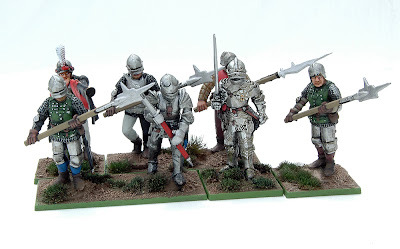 I've been thinking about the composition of Wars of the Roses armies in the rules sets I've read and the all important ratio between men-at-arms, billmen and archers. The bottom line is that we simply don't know the answer. 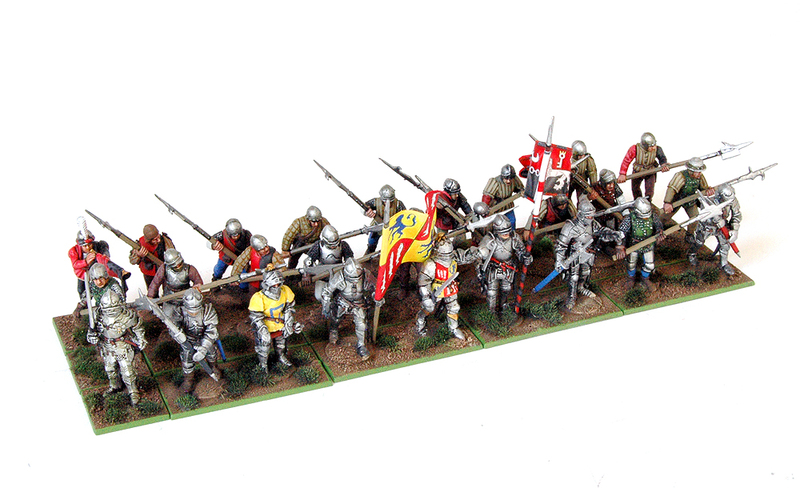 The only real records we have of the composition of fifteenth-century English armies are those relating to royal forces. The important thing to note is that these don't correspond necessarily to the tactical role the soldier played or the weaponry he carried. Basically, by the middle of the fifteenth century the royal records (and we're talking about the records of the Exchequer for the muster and payment of soldiers) list four types of soldiers: mounted men-at-arms at 12d a day; mounted archers and men-at-arms on foot at 8d; and archers on foot at 6d. While it's fair to surmise that the man-at-arms at 12d was a fully armoured man, armed with a poleaxe, what do we make of the archer at 6d. I suspect that in most cases he wasn't an archer at all, but a foot soldier armed with a brown bill. By the 1475 the ratio of 'men-at-arms' to 'archers' was 1:8, but did this mean eight archers to every man-at-arms? Almost certainly not. On a wargames and figures note, what do we make of this selection from the Perry Miniatures plastic boxed set? Who would be be paid a shilling, 8d or 6d a day? 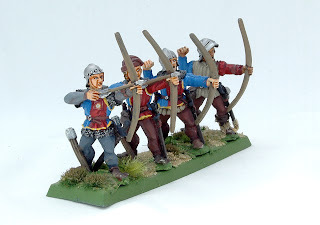 The rear rank of billmen and the few archers I've managed to paint. I actually purchased these figures and started painting them about ten years ago, but life got in the way. My painting style is still not 'wargamey' enough I fear; I've spent too long painting 1/35-scale figures. I'll have to work on it. The blue and murray livery colours and the sun badge on the rear of the livery jacket represent men of the Yorkist household - or perhaps the servants and friends of Edward's household, recruited for the campaign and given livery before they marched north. I like the bulky appearance of the Front Rank figures - a real contrast to my plastic Perrys that will make up my Lancastrian force. This is the first unit I have completed since getting back into figures. It's Edward IV at Towton, surrounded by his household knights and esquires with a rank of billmen, in Yorkist livery, to the rear. All the figures are from Front Rank. 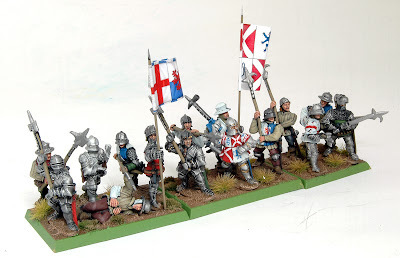 This blog is a little project to highlight my efforts to combine my history with my interest in modelling and wargaming. At the moment I'm building two Wars of the Roses armies: a Yorkist one with 28mm Front Rank figures and a Lancastrian with various Perry Miniatures. Will they ever meet on the field . .. I'm a fortysomething with a fascination for history and particularly the military history of the late middle ages and Renaissance. After my degree I was offered a job as a Games Designer at Games Workshop but turned it down and did a PhD. 20 years later I'm a university lecturer and am able to combine my hobby with work in a way.